Growing up, I spent a few years of my childhood in the south–Texas to be exact. My palate is definitely influenced by that time in my life. I have a penchant for things that are fried and still have a craving for biscuits and gravy. But the one thing I never seemed to get was red velvet cake. It just didn’t do anything for me, and I figured if I was going to have chocolate, I wanted it to look like chocolate. Plus we all remember the armadillo groom’s cake from Steel Magnolias. Yeah, that pretty much sealed the deal for me. 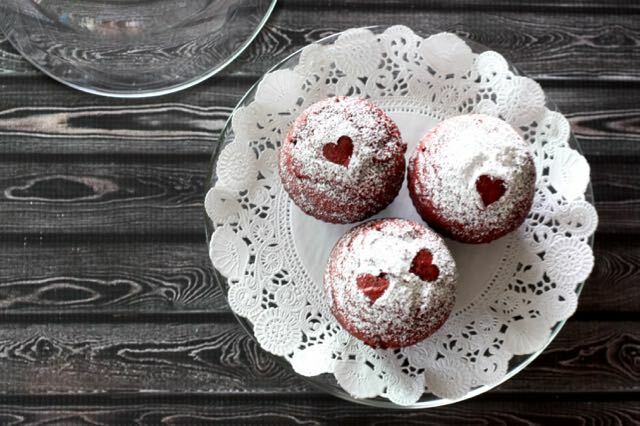 But with Valentine’s Day coming up, I wanted to add something new to the Recipe Box. I wanted chocolate. I wanted red. 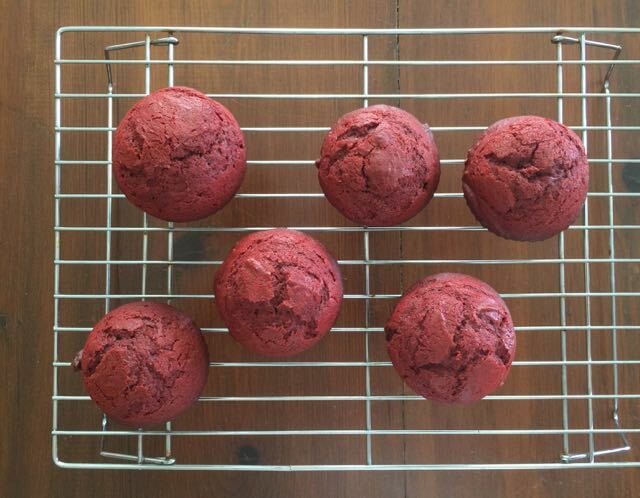 Which equals red velvet. I always try to stick close to the original Amish Friendship Bread recipe, so I made one batch with a chocolate pudding mix in lieu of dutch-processed cocoa. This recipe (we’ll call it #2) was made into cupcakes. 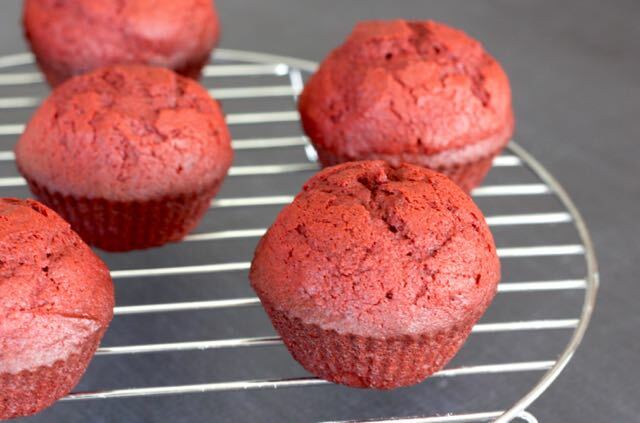 The cupcakes had a brighter red color and were delicious, especially when topped with our cream cheese frosting. Had I only made this recipe, I would have been really happy with how it turned out. Preheat oven to 325° F (165° C). Line a cupcake tin with baking cups. 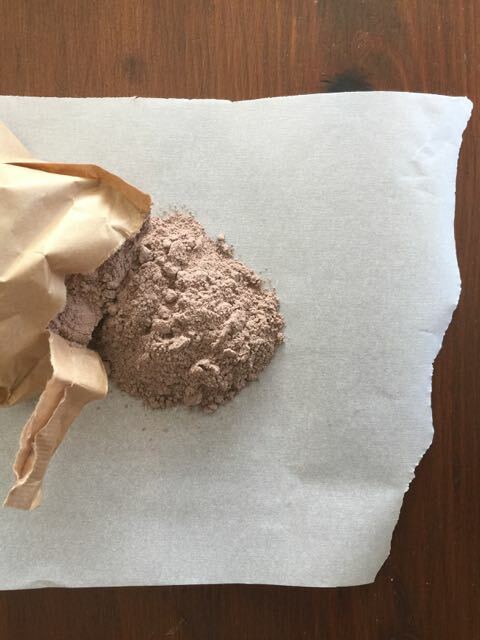 Sift flour with pudding mix, baking powder, salt and baking soda. Set aside. Cream butter, sugar, food coloring and vanilla, beating until well aerated. Add starter, oil, eggs, vinegar, and buttermilk. Mix until well incorporated. Create a well in the flour mixture and slowly add the starter mixture, mixing until combined after each addition. Fill baking cups to ⅔ full. Bake for 30 minutes or until a toothpick inserted in the center of the bread comes out clean. Allow to cool then frost with cream cheese frosting. But after I ate a bunch of those, I thought, You know, I really want to try this with the cocoa. I’m a gal who likes her chocolate, and I wanted to see if I could really vamp it up. This next version (we’ll call it #1) was made into a two-layer cake. Jackpot! Preheat oven to 350° F (176° C). Spray two 9" cake pans with baking spray and set aside. 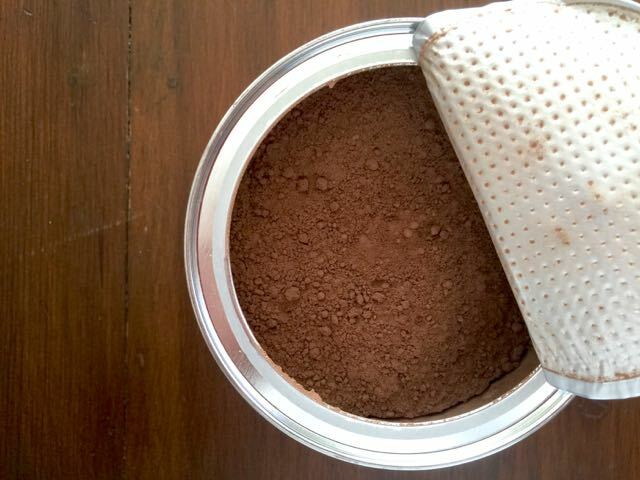 Sift flour with cocoa, baking powder, salt and baking soda. Set aside. 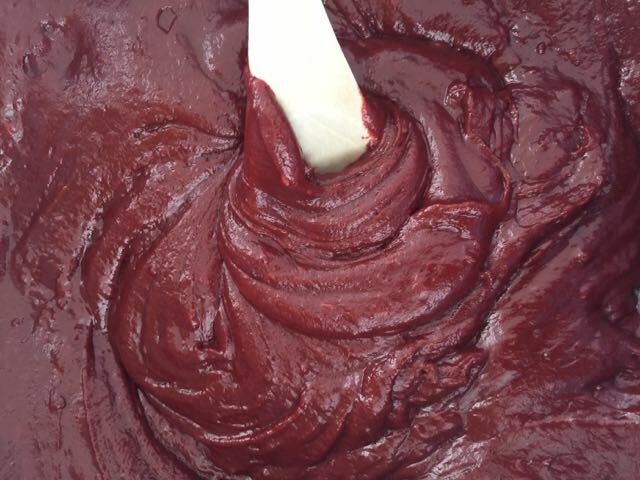 Cream butter, brown sugar, food coloring and vanilla, beating until well aerated. Add starter, eggs and buttermilk, then mix until well incorporated. Pour into prepared pans to ⅔ full. Bake for 35 minutes or until a toothpick inserted in the center of the bread comes out clean. Allow to cool. If making a double-layer cake, gently cut off the top layer of each cake with a serrated knife to create a smooth top. Frost the top of one of the cakes and then turn over the other cake and place it on top of the frosted cake, so that the cut areas are in the center of the cake. Frost the top of the cake or make another batch of frosting if you'd like to frost the whole cake. 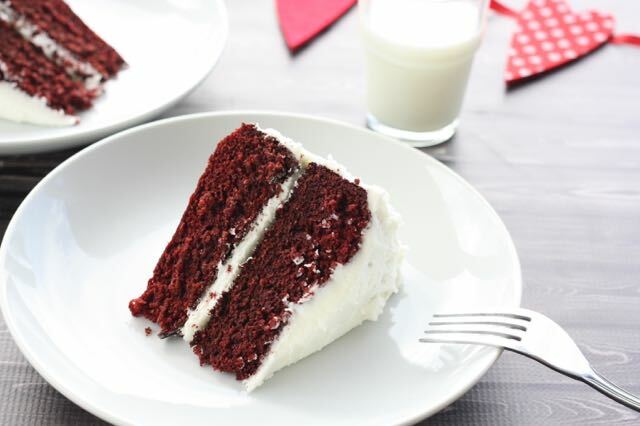 If you're noticing crumbs in your frosting, just frost a thin layer over the cake and place it in the fridge to set. 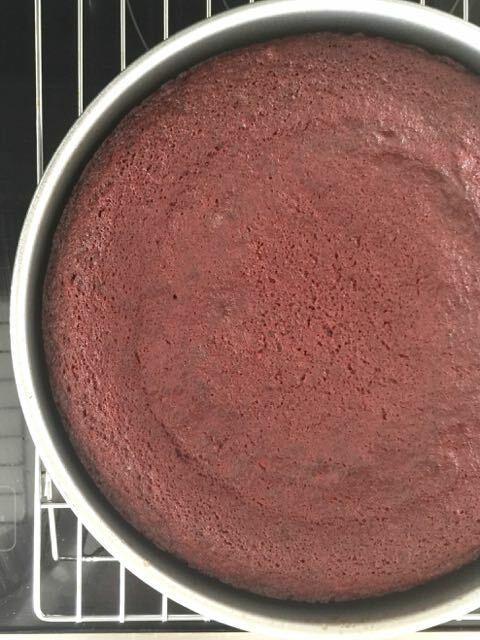 After 30-45 minutes, remove the cake from the fridge and frost a fresh layer over the old one. 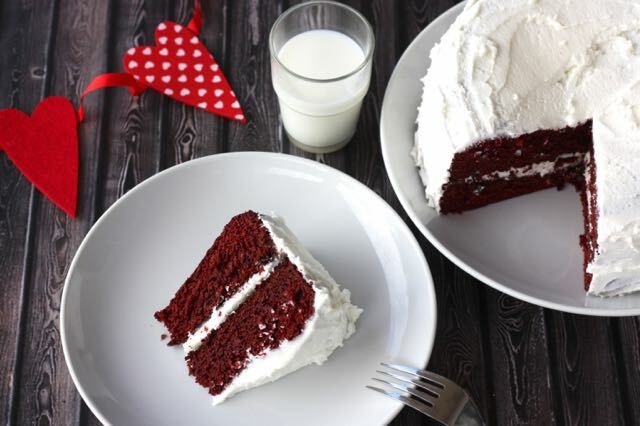 I did a taste test with family members and friends, giving them a bite of recipe #1, recipe #2, and a store-bought red velvet. Only one person preferred the store-bought version, but everyone else was split down the middle in terms of flavor AND, once they saw the two different cakes, the color. I know I’ll be making both versions in the future, so I’m including them both here. Happy Valentine’s Day, everyone! I would love to make this for my husband and daughter who love anything red velevt. I can’t wait to make this for my husband and son for Valentine’s Day! I have red velvet instant pudding, so I’m going to use that and leave out the food coloring. I am also going to substitute the buttermilk with 1/2 cup milk and 1.5 tsp. vinegar since I don’t have buttermilk. Do you think it’s necessary to add another tsp. of vinegar? I hope it turned out great! What did you end up doing? We haven’t tried it that way, but if you’re substituting buttermilk, the recipe will probably require an extra teaspoon of vinegar. We’d love to hear how it turned out! 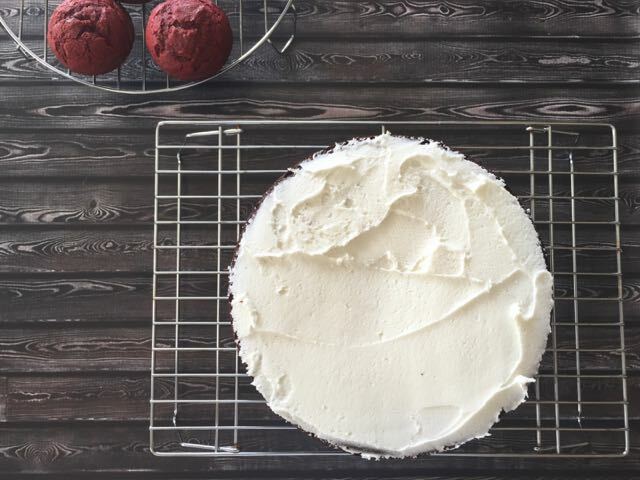 I made this for my daughter-in-law who loves anything Red Velvet. It came out great. I had to make it again for myself because it was gone in record time. Will definitely make it again. 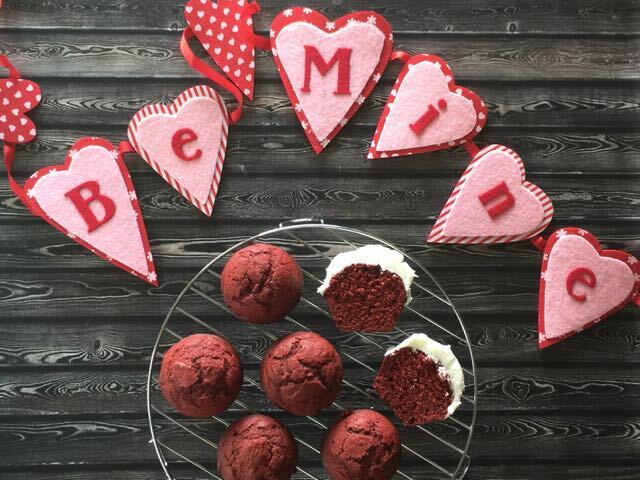 This turned out amazing for a valentine’s day party! ½ cup, Flora! It was hard to see because it was mashed up against another ingredient, but I fixed the formatting so it should view (and print!) properly. Thanks!